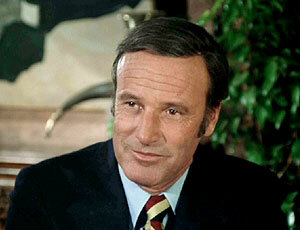 Actor Richard Anderson has passed away at the age of 91. 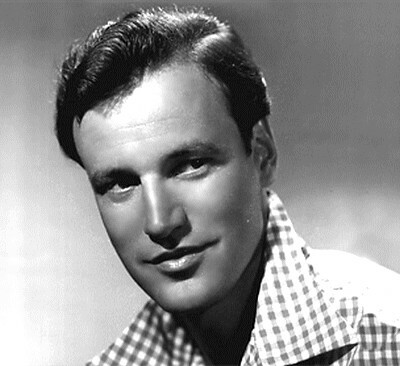 Anderson was born in New Jersey on August 8, 1926, and he died today, August 31st. 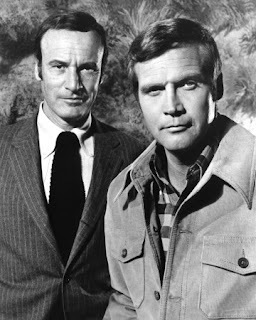 There are two distinct periods in Anderson's long career I especially enjoy: his early career years in numerous films at MGM, where he gradually moved up from bit roles to meatier supporting parts, and of course his role as Oscar Goldman on THE SIX MILLION DOLLAR MAN (1974-78), starring Lee Majors, and THE BIONIC WOMAN (1976-78), starring Lindsay Wagner. 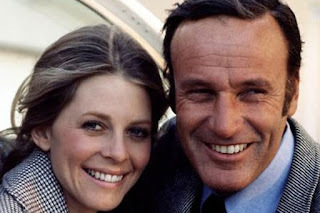 While I wasn't a particular fan of THE SIX MILLION DOLLAR MAN, I never missed THE BIONIC WOMAN, where the heart of the show for me was Anderson's sympathetic and often touching mentor/friend relationship with the Emmy-winning Wagner. Wagner was quoted today in The Hollywood Reporter: "I can't begin to say how much I have always admired and have been grateful for the elegance and loving friendship I was blessed to have with Richard Anderson." Majors called Anderson "a dear and loyal friend." Coincidentally, Wagner and Majors were just reunited in a new Hallmark Channel film, EAT, PLAY, LOVE (2017). My husband had the good fortune to meet Anderson at San Diego Comic Con a few years ago and said they had a wonderful conversation. 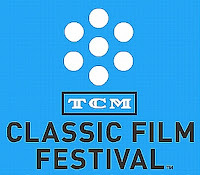 My friend Will McKinley interviewed Anderson briefly at the 2012 TCM Classic Film Festival; you can see the video here. 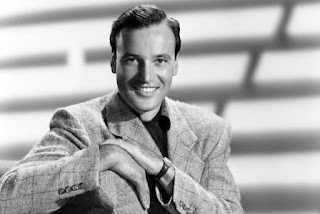 Anderson was briefly married to Carol Lee Ladd, daughter of agent Sue Carol and stepdaughter of Alan Ladd; he later married Katharine Thalberg, the daughter of Norma Shearer and Irving Thalberg. He is survived by three daughters. Obituaries have also appeared in USA Today and The New York Times. Farewell to an actor who brought a special something extra to everything in which he appeared. Richard Anderson films reviewed at Laura's Miscellaneous Musings: A LIFE OF HER OWN (1950), PAYMENT ON DEMAND (1951), CAUSE FOR ALARM! 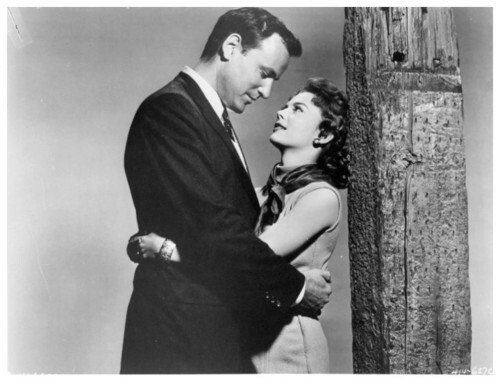 (1951), NO QUESTIONS ASKED (1951), RICH, YOUNG AND PRETTY (1951), THE PEOPLE AGAINST O'HARA (1951), JUST THIS ONCE (1952), SCARAMOUCHE (1952), I LOVE MELVIN (1953), GIVE A GIRL A BREAK (1953), ESCAPE FROM FORT BRAVO (1953), HIT THE DECK (1955), A CRY IN THE NIGHT (1956) (also here), THREE BRAVE MEN (1956), THE GUNFIGHT AT DODGE CITY (1959), and SEVEN DAYS IN MAY (1964) (also here). 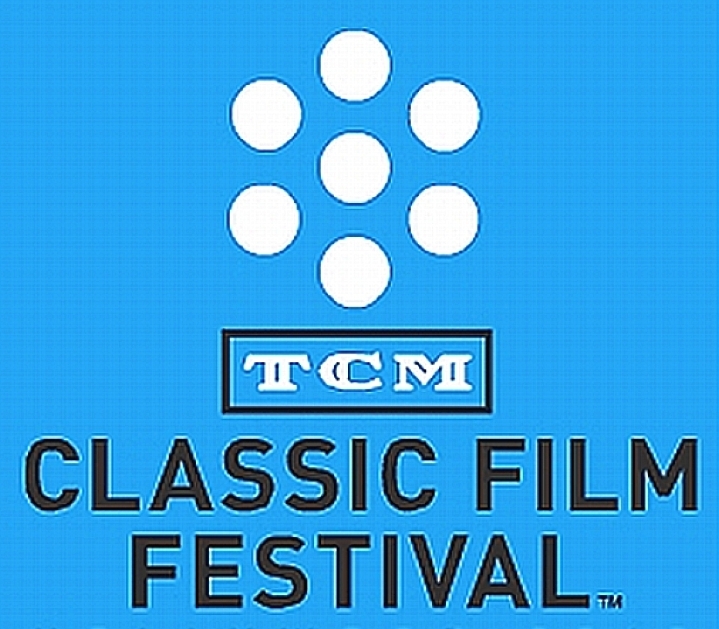 Today Turner Classic Movies announced the dates and theme for the 2018 TCM Classic Film Festival! The festival will be held in Hollywood from April 26th to 29th, 2018. TCM posted a promo video on Twitter. I especially enjoyed seeing it as it features some of the friends I love spending time with at each festival! The 2018 theme will be ""Powerful Words: The Page Onscreen," "celebrating the representation of the written word on the silver screen." The festival website also says "From original screenplays to unique adaptations to portrayals of writers real and imagined, we will celebrate the foundation of great film: the written word." The Hollywood Roosevelt Hotel will again serve as festival headquarters and the location of Club TCM. The prices for festival passes, which go on sale in November, are holding steady after increases for the 2017 festival. The Classic pass, which many festival attendees consider the best deal, remains $649. The Palace pass for the Egyptian and the "big" Chinese theater is $299; it also includes poolside screenings at the Hollywood Roosevelt Hotel. The Essential pass, which includes the opening night Red Carpet Gala screening, is $799, and the ultra-deluxe Spotlight pass is $2,149. Please consult the festival website for additional pass details. I've already booked my hotel room! 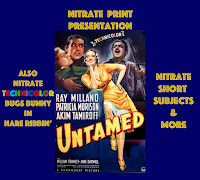 Every year TCM seems to outdo itself; last year's festival saw improved access to rare films, which were often screened in the larger Eygyptian Theatre, plus the screening of four nitrate prints thanks to the Egyptian's recently installed nitrate projection booth. I highly encourage anyone who's been thinking of attending the festival to make 2018 the year! Seeing beautiful prints in historic venues with other enthusiastic classic film fans is an unforgettable experience. Please visit my overview of the 2017 Festival for a thorough look at the TCM Classic Film Festival experience. Links to my coverage of past TCM festivals may be found at the bottom of that post. Those interested in attending will also want to monitor the festival website and the TCM Twitter feed. And of course, as always, I'll be updating news on the festival as it's announced! Stay tuned for more information in the weeks and months to come. Hope to see many of you in Hollywood next April! October 2017 Update: TCM Classic Film Festival Announcements. March 2018 Update: The Latest TCM Classic Film Festival Announcements. April 2018 Update: The 2018 TCM Classic Film Festival Schedule. 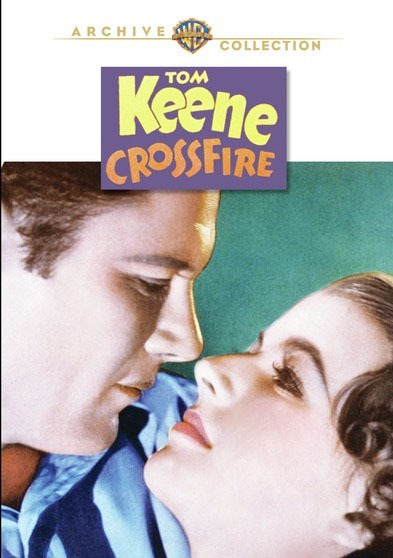 Tom Keene stars in CROSS FIRE (1933), a quirky and entertaining WWI-era Western just released on DVD by the Warner Archive. My previous sole experience with Keene as a Western hero, COME ON DANGER! (1932), left me less than impressed, but I wanted to give him a second chance. I'm glad I did, as I found CROSS FIRE to be a fun 55 minutes, starting with the nicely scored opening credits. Keene plays Tom Allen, who runs a Sierra mine for five elderly businessmen who are beloved father figures for him. Tom goes off to fight in WWI, leaving the mine's management to Bert (Eddie Phillips)...but Bert turns out not to be the nice guy everyone thought he was. Tom returns from Europe to find one of his friends framed for murder, and they're all hiding out in the mountains. Tom needs to find a way to clear the men and bring Bert, the man behind the crimes, to justice. Betty Furness, who plays Tom's love interest Pat, is introduced near the start of the film as a schoolgirl in a sailor suit who moons over the dashing Tom; then when he returns from the war she's a more grown-up young lady. The movie has unique little touches, such as Tom racing past the town's lone stoplight on horseback, spinning the sign whle a jalopy sits at the "intersection." Production values are good, including a nicely designed outdoor lunch counter operated by Pat and some impressive stunt work jumping into a lake -- although I think they really had a horse make the jump along with a stuntman, yikes! The film does a good job melding a traditional Western with the more modern era in a logical way, which helps the film stand out a bit from the norm. (The final gun battle is a doozy, including a machine gun!) In this regard the film seems more authentic than later Westerns set in what I call "Roy Rogers Land," a mashup of eras which doesn't really make sense, though it's fun. 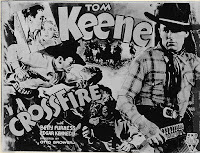 CROSS FIRE was one of a dozen RKO Westerns starring Keene. He plays a good-natured man, very much the type of role George O'Brien made his own in Westerns throughout the '30s; one could easily envision O'Brien in this role. All in all this film was a big improvement over the previous Keene Western I'd seen, and I'll be looking for more of his films in the future. 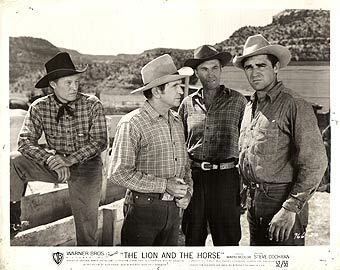 The solid cast includes Edgar Kennedy, Stanley Blystone, and Lafe McKee, plus Yakima Canutt handling the stunts. 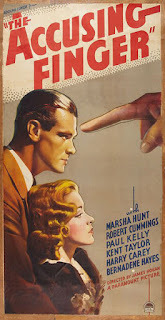 CROSS FIRE was directed by Otto Brower and filmed by Nicholas Musuraca. Locations included Vasquez Rocks and Red Rock Canyon, two spots I frequently drive past on my trips to the Sierras. The print quality is good, especially considering the film's age. There are no extras. Steve Cochran stars in THE LION AND THE HORSE (1952), a contemporary Western just released on DVD by the Warner Archive. Cochran is more often associated with playing villains, but I find him especially compelling in his rare good guy roles, such as in TOMORROW IS ANOTHER DAY (1951). 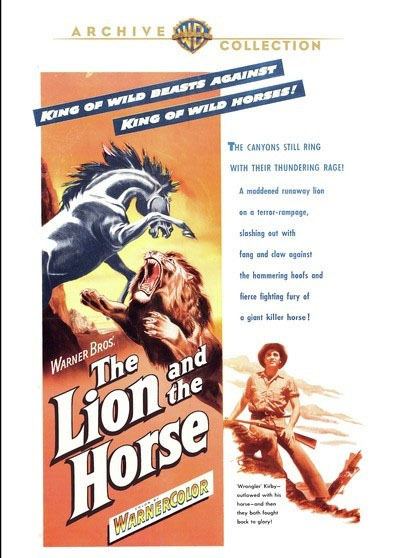 That's also the case with THE LION AND THE HORSE, in which Cochran plays a wandering cowboy who falls in love with a stallion and also finds himself a ready-made family in a little girl named Jenny (Sherry Jackson) and her grandfather (Harry Antrim). 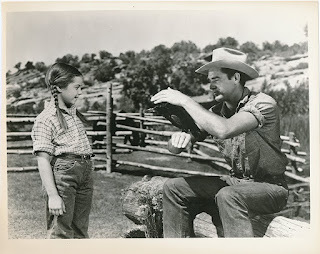 Ben Kirby (Cochran) is working with Matt Jennings (Bob Steele) and his hands to round up wild horses when he spots the black stallion leading the group and has to have him for his own. When the stallion gets away Ben tracks him relentlessly and finally catches him, but he doesn't initially tell Matt. When Matt's men discover the horse has been caught, they're understandably unhappy Ben didn't mention it, since their deal is to sell all the horses and divide up the proceeds. Ben offers to give up his share of income to the other men in return for the horse. They agree, if he'll also pay $500. Ben hustles to earn the needed money but when he returns in a few days, the horse has been sold to Dave Tracy (Ray Teal), who's making money letting rodeo riders attempt to break the stallion. Tracy won't sell, and since the horse is being abused and likely to break a leg at any time, Ben "helps" the horse escape. 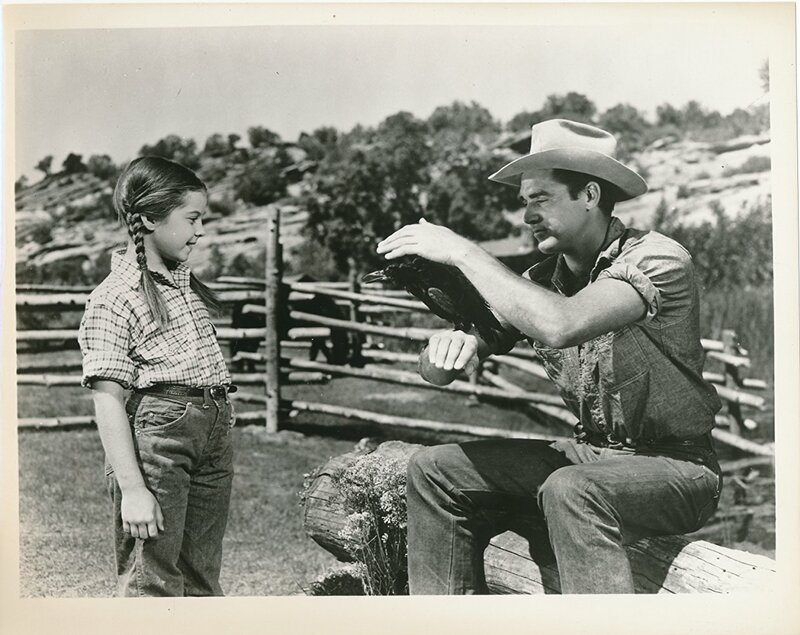 Eventually Ben and the stallion end up on a farm with Cas Bagley (Antrim) and his granddaughter (Jackson), where Ben gradually becomes one of the family while working for Mr. Bagley and also taming the horse. But Tracy is on Ben's trail...and about that lion in the title? He's escaped from a circus, and he means trouble. This is a pleasant if unremarkable family film which is greatly helped by two key factors, Cochran's performance and extensive location shooting at Zion National Park. The majority of the film was shot outdoors, save for some pretty bad soundstage shots in the final third of the movie, and the realistic, beautiful locations add considerably to the film. 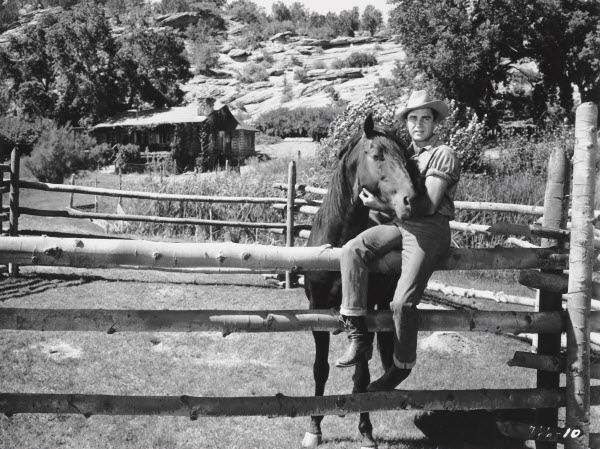 Cochran is excellent as Ben, and quite touching in his devotion to the horse and later his new family. There's a scene where he has to say goodbye to Jenny and blinks back tears which was quite moving. Ben is by no means a perfect angel, initially hiding the horse from his coworkers and later essentially stealing him back when he "liberates" the horse, but we also see he's a good man. When confronted, he immediately agrees to fairly compensate the other cowboys for the horse -- only to have the horse sold behind his back! And his determination not to see such a beautiful animal ruined by Tracy is quite understandable. The horse later exacts his own, most satisfactory form of justice in a confrontation with his former owner. 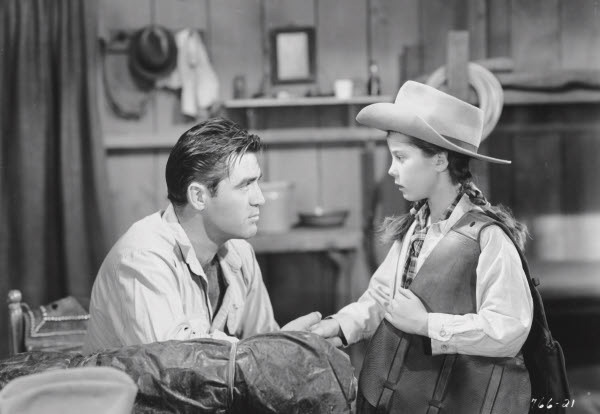 Jackson is cute as Jenny, and the cast is rounded out with character faces such as George O'Hanlon, Lane Chandler, House Peters Jr., and Tom Tyler. That said, overall I found the film a pleasant 83 minutes, and I suspect many of my fellow Westerns fans will enjoy spending time with it as well. The movie was written by Crane Wilbur and directed by Louis King. The film was scored by Max Steiner. THE LION AND THE HORSE was filmed by Edwin DuPar in Warnercolor, a format which tends to not hold up well; like another Warnercolor Archive release I've reviewed, THE BIG LAND (1957), the print's color is highly variable. Some scenes are quite faded, almost looking like the pastels of Trucolor, while other scenes are bright and good-looking. In addition to the problems inherent with Warnercolor, the print is quite a bit rougher in spots than is typical for the Archive, with periodic scratches and speckles. The DVD is still entirely watchable and enjoyable, with no skips and good sound, and if it's a choice between this print or no release at all, I'm glad they put it out. Many Western fans will doubtless be happy to have this disc, they should simply be aware of the print's condition in advance. Here's the next in a series of photo posts from this summer's road trip to Oregon, which took us through San Francisco as we headed north and inland through the Sierra Nevadas on the drive home. Click any photo to enlarge for a closer look! For photos of the above area as it looked in the film, visit Reel SF. After breakfast at the appropriately themed Hollywood Cafe the next morning, we headed for Montgomery Street, where Lauren Bacall's DARK PASSAGE (1947) apartment still stands. Humphrey Bogart costarred with Bacall. We were amused to discover that THE HOUSE ON TELEGRAPH HILL (1951) was just steps down Montgomery Street from the DARK PASSAGE apartment. Richard Basehart and Valentina Cortesa lived here in the thriller directed by Robert Wise. Based on construction materials visible here, the building, a former restaurant, is currently undergoing renovations. The house doesn't appear identically as it did in the film, due in part to a fake facade constructed around the building for the movie. 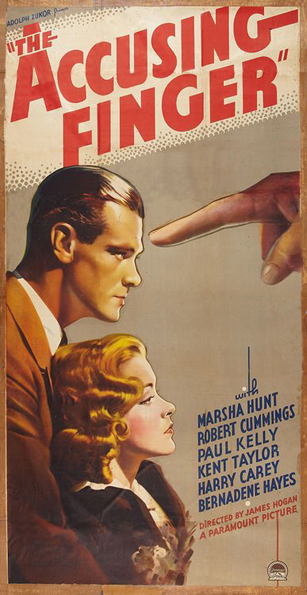 For a more detailed history, including screen shots, visit Robby's post at Dear Old Hollywood, along with Reel SF. The beautiful view from "The House on Telegraph Hill." Incidentally, the scenes in the yard were actually filmed in the garden at Coit Tower a little higher up the hill. 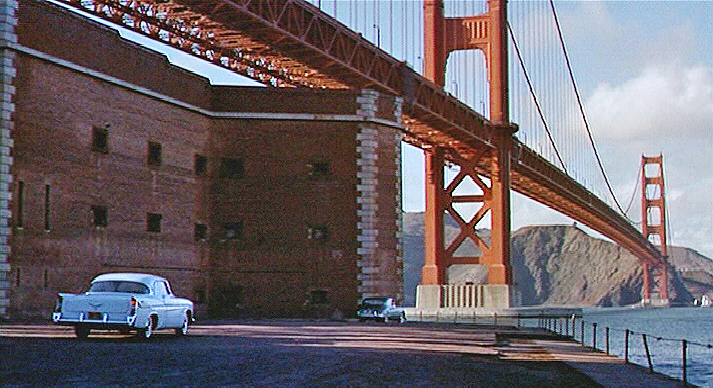 The corner building below is James Stewart's house in VERTIGO (1958). We didn't drive further up Lombard Street for a better look at the entrance as we were trying to spare our car as many of the steep hills as we could! The original entry at the left of the building has been walled off and gated, so it looks quite different from its appearance in the film. For more photos, I again recommend visiting Reel SF, which is a great resource for San Francisco movie locations! 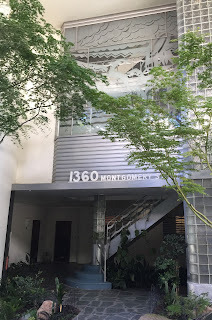 Virginie Pronovost has also posted excellent photos of additional VERTIGO locations at THE WONDERFUL WORLD OF CINEMA. Fort Point, at the foot of the Golden Gate Bridge, is a key location in multiple films, including both VERTIGO and THE MAN WHO CHEATED HIMSELF (1950), which I saw at this year's Noir City Film Festival. 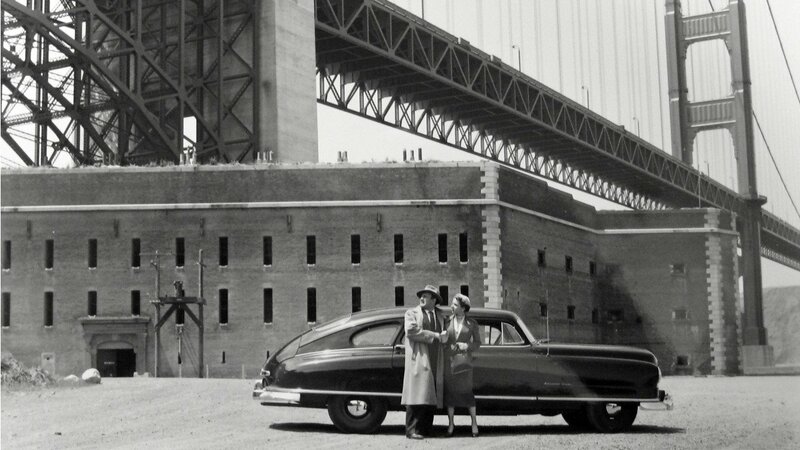 ...and nearly a decade earlier, here are Lee J. Cobb and Jane Wyatt outside the fort in THE MAN WHO CHEATED HIMSELF. Due to fencing, this was as close as I could get to where Kim Novak jumps into the bay in VERTIGO! Walking inside the fort was an amazing experience! It was built between 1853 and 1861. My husband recognized Fort Point as the location where a helicopter lands in POINT BLANK (1967) with Lee Marvin. I've got a copy of that film so I can check it out soon. There were movie locations on the drive home as well! I wrote about the Bridgeport locations for OUT OF THE PAST (1947) and NIGHTFALL (1957) in 2010 and 2014; please click on the links to check out photos and more extensive information on those sites. ...and Ken's Sporting Goods, seen here on the left, was Marny's Diner in the same film, with a different porch. Finally, I'm fond of THE SECRET OF CONVICT LAKE (1951), which starred Glenn Ford, Gene Tierney, and Zachary Scott. While the village in the film was clearly built on a soundstage, here's a nice look at the real Convict Lake for fans of the film! I'll be posting additional "road trip" photos in the future, including a look at the Walt Disney Family Museum in San Francisco. Here's the first in a series of photo posts from this summer's road trip to San Francisco, Oregon, and the Sierras! The day after our daughter's graduation from the University of Oregon we visited Owen Rose Garden in Eugene, where I snapped some of these gorgeous flowers. Click any photo to enlarge for a closer look. 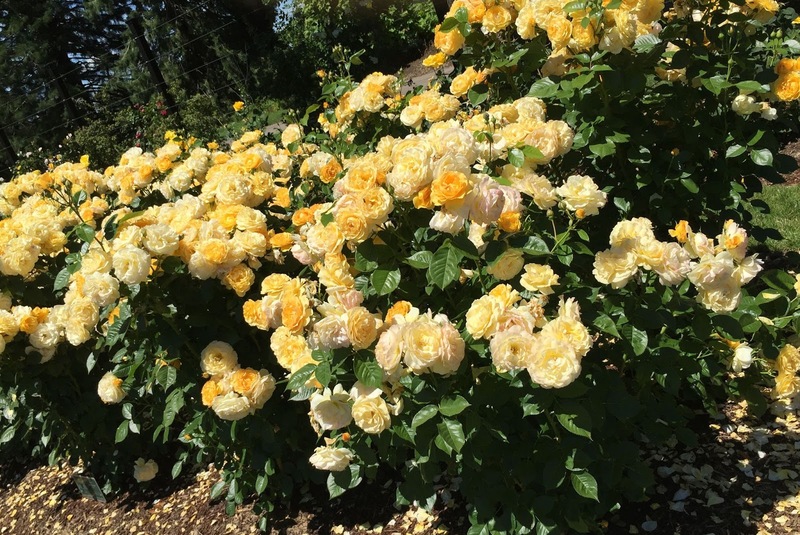 The Rose Garden is a beautiful spot which is definitely worth a stop when visiting Eugene. It's easy to see why we enjoy spending time in Oregon, aside from visiting our daughter and son-in-law! More "Photos From the Road" still to come: San Francisco classic film locations, the Walt Disney Family Museum, and Highway 395.